A couple of films, then. By the way, I must apologise in advance for January and February, as I am up against two deadlines, one of them for six episodes of Mr Blue Sky for Radio 4 by mid-March, so I am bound to find less time to write longer form blog entries. But I’ll try and keep up with the films. The Girl With The Dragon Tattoo came out on Boxing Day and I saw it a couple of days ago. It’s very good. This is the American remake of the Swedish original; an economic inevitability when much of the English-speaking world fears subtitles. In many ways, Columbia and David Fincher are providing a public service. What Fincher and screenwriter Steve Zailian have done is to sensibly retain the Swedish setting of the Trilogy, specifically metropolitan Stockholm and the remote private island, and in doing so have been able to mine the same themes of national identity and deep Nazi guilt without them seeming odd. One person on Twitter asked me if they’d “Yanked it up”. Well, not really, especially as most of the principals are English, specifically the well-cast and low-key Daniel Craig (who looks Swedish but doesn’t attempt the Swedish accent, just about getting away with it, as the English accent he uses is deliberately bland and generic), Christopher Plummer (who does a fabulous job with his), Steven Berkoff, Geraldine James, Donald Sumpter, Julian Sands and Joely Richardson (whose character is Swedish but moved to London, explaining her Anglicised voice). Don’t get me wrong, I didn’t obsess about the accents while watching the film. In fact, I applaud everyone apart from Craig for having a go; it means you can get on with immersing yourself in the fiction. (I couldn’t take Valkyrie seriously, for instance, as the cast spoke in their own accents, mostly American, and not German.) So, no, it’s not “Yanked up”. The only key Americans in Dragon Tattoo are Robin Wright (who looks Swedish) and Rooney Mara, who does a great job at Lisbeth – she’s just as grim-faced, androgynous and lithe as Noomi Rapace, and defies you to look upon her with laddish lust. If you’ve never seen the original because you are “too lazy” to read subtitles (I don’t hold with this generalisation, by the way, I’m ironically quoting a snob who used the phrase on Twitter), then dive in. This is definitely grown up cinema – it’s an 18, and earns that not through the usual visceral violence, but through scenes of a sexual nature that are far from conventionally titillating and do not involve consent. It’s dark material. But brilliantly made. And the James Bond-style opening credits, over Trent Reznor’s cover of Immigrant Song, are almost worth the ticket alone. My Week With Marilyn has been out even longer than Dragon Tattoo, but the Curzon in Soho seems to be showing a variety of older films with awards buzz this week, so I made the most of it. What a disappointment. It’s Michelle Williams’ performance as Marilyn Monroe and Kenneth Branagh’s as Laurence Olivier that are attracting attention, and both are commendable and in the latter case, often hilarious. But the film wrapped around them, based upon the memoir by Colin Clark, who, aged 23, found himself working as third assistant director on The Prince and The Showgirl at Pinewood (he’s played by the handsome Eddie Redmayne), is deeply confused. It begins as a sort of lively period farce about the young toff’s introduction to the British film industry and rattles along with the same spot-the-real-person appeal as, say, The Iron Lady, or, frankly, any drama about a sad British comedian’s secret pain made by BBC4: “Ooh look, that’s Vivien Leigh! That’s Dame Sybil Thorndike! That’s cinematographer Jack Cardiff! That’s Arthur P Jacobs, future producer of Planet Of The Apes!” (a couple for the cineastes, there) … But in the second half it softens into the soft-focus, doomed Platonic love affair between Clark and Monroe. Because it’s based on Clark’s account, published after Marilyn was long dead, we only have his word for what went on behind closed doors (he died in 2002, by the way), and it all starts to feel a little like a laddish fantasy. We have to believe that after hubby Arthur Miller’s departure from England, Marilyn was unable to work without Colin by her side. He doesn’t do anything as ungentlemanly as try to get off with her while she is drugged into a hazy state of consciousness, but he does get to spend a lot of time with her, and, in one key scene, skinny dip in a river. With Marilyn Monroe. I’m not saying it didn’t happen this way, but I am saying that I found it difficult to buy into. I much preferred the film when it was Branagh having a whale of a time impersonating Olivier, stomping about and swearing around a sound stage. The period detail was good, but the story was awkward: Monroe was clearly a mess, and the film doesn’t shy away from showing this, and yet, it all ends swimmingly. The captions at the end remind us that her next film, Some Like It Hot, was a smash hit. Hooray! Never mind that Monroe would die, alone, aged 36, poisoned by barbiturates, within a few years. Also, Emma Watson was in it. I thought she’d decided to knock acting on the head? My Week With Marilyn is anything but lacking in appeal. But it really wasn’t worth going all the way to the cinema to see it. If Williams or Branagh find themselves with award nominations for their parts, it will be fine and dandy, as both put in good work. But the film strives to be both saccharine and sad at the same time, and, for me, ultimately curdles. It present Monroe as a dependent flake from the beginning, and then is at pains to say, actually, she was a great screen actress. I think she was, by the way, although not so much in The Prince and The Showgirl. After Never Let Me Go, I needed to see something that was going to live up to expectations. True Grit fulfilled that brief. I speak as a fan of classic westerns, a fan of the Coen brothers, a fan of the Henry Hathaway original, a fan of Jeff Bridges and Matt Damon, and a cynic of Hollywood remakes, which, for all the dressing up, this is. The Coens use the Brighton Rock Defence and claim that their True Grit is a remake of the original 1968 Charles Portis novel and not the 1969 Hathaway film, which won John Wayne his only Oscar. Certainly, the novel seems to have revolved around its 14-year old protagonist Mattie Ross more than in the subsequent first film, which became a vehicle for Wayne as fat, drunken, one-eyed marshal Reuben “Rooster” Cogburn. Here, although Bridges eats up the screen with his own drawling take on the character, Mattie (played near-miraculously by then-13-year-old Hailee Steinfeld) reclaims centre stage. It’s her film – which is to say, it’s Steinfeld’s film – and in that sense, the Coens have repositioned what most people know as a John Wayne film incredibly successfully. I love the original, but that’s really because I have an enormous soft spot for Wayne and for the mythic iconography of the western. This is not a “revisionist” take on the genre; it is an overwhelmingly affectionate tribute to the great westerns of the past. The Coens love westerns. Some of their previous work hints at this: Blood Simple, with the cowboy boots and pistols of its Texan setting, might structurally and thematically be described as a modern-day western as much as a neo-noir, O Brother Where Art Thou? has a western-style relationship with the wide open spaces of the American landscape, while No Country For Old Men might as well have been a dry run for their first, full-on cowboy film set in the Old West. They were born to do True Grit. And what a triumph it is. I don’t often see films that bring to mind the word “faultless”, but this did. The fact that it’s a remake, and that the story is so familiar to me, becomes irrelevant almost instantly. The Coens make it their own. The script is so beautifully crafted and sculpted, and witty without being jokey, it is a pure delight to listen to. In the mouths of Steinfeld, Bridges and Damon, this highly decorative but homogenous language takes on its own character, and whether it’s an exchange between Mattie and the horse trader, or Damon’s LeBoeuf and Cogburn, or Mattie and outlaw Ned Pepper (Barry Pepper – what a fortuitous bit of casting! ), their individual relationships emerge. There’s some fine, nuanced acting going on here, and if Steinfeld and Bridges don’t scoop up something at tonight’s Baftas or next week’s Oscars, there is no justice. The Coens are prone to irony, which is what makes their comedies such fun, but when they step back from this fruitful form of postmodernism and play it a little more sincere, it pays dividends. (For instance, I enjoyed Burn After Reading, but feel no need to see it again. I have watched Fargo many times, and Blood Simple, come to that. Oh, and I hated The Ladykillers just as much as you did.) 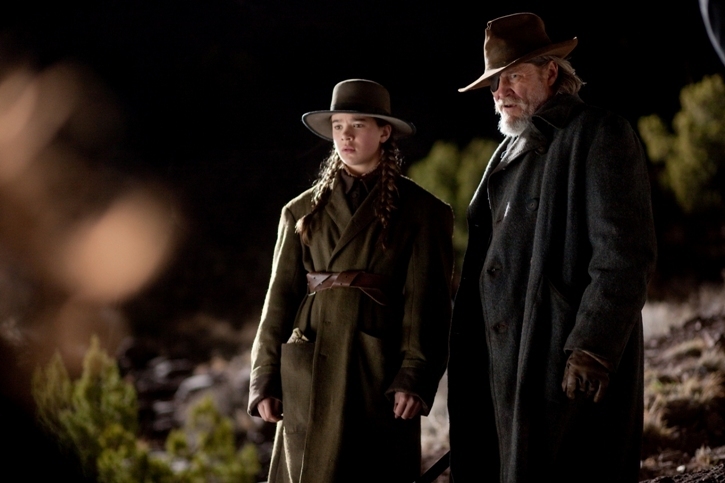 Although True Grit is a genre picture, it does not seek to overturn or modernise – or “revise” – that genre; it is reverent to its source, and as formal as they promised at the outset: the iconography is present and correct – there’s a truly stunning shot with the three riders, Mattie, Cogburn and LaBoeuf, captured within a glorious landscape (New Mexico stands in for the Choctaw Nation or what became, in 1907, Oklahoma) and it’s simply perfect – and the soundtrack, by longtime collaborator Carter Burwell, breaks new old ground by working in hymns of the time, thus making it ineligible for the Best Original Soundtrack Oscar, the same cruel fate that befell Clint Mansell’s impressive score for Black Swan. If you don’t like westerns and what made the classic westerns great, you might understandably not like True Grit. (There were three teenage boys in the row in front of us at the Curzon who were fidgeting and rustling crisp bags most of the way through it – I’m not 100% sure what they were doing in there in the first place.) But the Coens’ attention to texture and composition as well as to performance and language make it one of their very finest works. And who would have guessed that from the news that they were doing a remake? It stands with the very best westerns; for me, it’s the equal of Unforgiven.